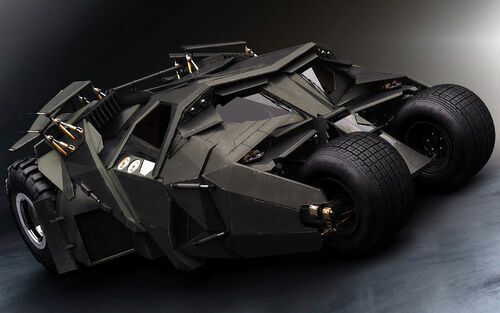 Truth be told, the Tumbler would be a horrible vehicle for Batman to drive on a daily basis. Evidently, the folks at Aston Martin agree, since they've dropped this absolutely sinister looking Vanquish Carbon Edition. It's all black, inside and out. Think of it as Bruce Wayne meets James Bond. The lightest shades on the entire car are the carbon brakes and some splashes of carbon fiber trim, though you can request your brake calipers in whatever color you want. Inside, it's more of the same. Nearly the only things you'll come in contact with are wrapped in black leather, and what isn't is gorgeously woven carbon fiber panels. Underneath everything, it's still a Vanquish, which means there's a 568 hp V12 lurking under the hood and it'll still do 201 mph. So many parts have been replaced with carbon fiber, including the roof and this impossibly beautiful rear fascia that the car's actually quite a bit lighter. (Aston's not saying just by how much.) Don't want the Joker knowing everything, you know? Oh yeah, and you can get it with this insanely cool machined Aston Martin badge from a single block of carbon. You can even order the car in white, but why on Earth would you? Aaron Miller is the Rides editor for Supercompressor, and can be found on Twitter. He would totally dress up as Batman if it meant he could drive this car every day.